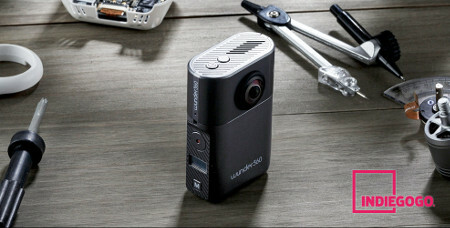 Touted to be the first 3D scanning and 360 AI camera in the world, the Wunder360 S1 also carries the distinction of being the only consumer-oriented compact camera that offers consumers the ability to create 3D models from their 360 footages that have been captured by the camera. Whatever 3D models that are generated by the Wunder360 cloud service can then be shared with others online, and it can also be imported into mainstream 3D editing professional software for further editing. The Wunder360’s cloud service is touted to be able to generate high enough quality 3D point cloud, allowing it to create a 3D model from it. These models are not there just to look pretty, the can also be imported into Minecraft or viewed via VR/AR headsets such as the HoloLens. Enthusiasts and professionals in select arenas can take advantage of a tool from the Wunder360 team to convert the models into virtual tours, where a regular smartphone can then view such tours. The application is virtually endless! This is made possible courtesy of the built-in high-performance DSPs and Deep Learning algorithms, opening the pathway for a slew of intelligent editing functions that will appeal to beginners and seasoned users alike. With an asking price of $135 a pop while offering up to 4k resolution photos and 3k 30fps/1080p 60fps videos capturing, the Wunder360 S1 is certainly worth every penny.